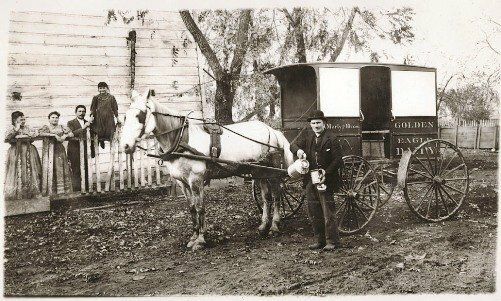 On January 11, 1878, milk was delivered to customers in bottles for the first time. Somewhere along the line, the momentous occasion was honored with an unofficial holiday, which we celebrate each year on the 11th of January. – Unused product from cereal factories is sold to dairy farmers every twice a month to serve as food for the cows. – Cows also enjoy eating potato chips and cotton seed. – A mixture known as TMR (Total Mixed Ration), which is comprised of barley, corn, cotton seed, field grasses, hay, and bakery or grocery by-products, is fed to cows up to eight times a day. – Cows are ruminant mammal with a digestive system consisting of four compartments. – A cow drinks approximately 30 to 40 gallons of water each day! 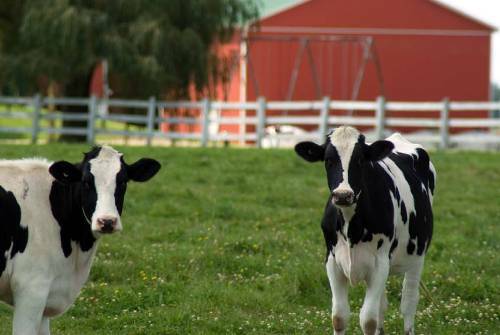 – Costs vary due to many factors, but on average, cows eat about 80 pounds a day, at a cost of $3.50. – Mother cows produce up to 8 gallons of milk per day. – During travel in refrigerated storage tanker trucks, raw milk is cooled to 38 degrees. – Upon arrival for processing the raw milk is pumped from the truck storage tanks and sent to the homogenizer and pasteurizer. – During Homogenization the butter fat is broken up and mixed into the rest of the milk. – The Pasteurization process consists off quickly heating the milk to 145 degrees Fahrenheit, killing any bacteria that might be found in the milk. We all know how important Calcium is to the strength and health of our bones and milk is a great way to give our body some of what it needs. Did you know that of all the minerals in the human body, Calcium is the most abundant? And that 99% of it is contained in our bones and teeth? Calcium plays a huge role in helping your bones to remain strong throughout your life by slowing the rate of bone loss as you age. According to the Dairy Council of California it’s important have a diet rich in Calcium starting in childhood so you can reap the benefits when you’re old. Fracture incidence among children has increased by one-third in boys and one-half in girls compared to a generation ago. A diet high in calcium, especially during the adolescent years, helps build bone mass to prevent osteoporosis later in life, as well as reducing fracture risk now and later. Calcium also helps with muscle contraction, normal nerve function, and proper blood clotting. Another important component to the overall health of your body that can be found in milk and other dairy products is Vitamin D.
The human body needs Vitamin D to help in the absorption of Calcium and Phosphorus, help with muscle contraction, help regulate blood pressure, and help transmit nerve impulses. Here’s an interesting fact from the Dairy Council of California…..Before the fortification of milk with Vitamin D began in the 1930s, rickets was a huge public health issue. The addition of 10 micrograms (400 IU) of vitamin D per quart was directly linked to the decline in the number of cases. In 2010 the Institute of Medicine (IOM) found that an average daily intake of 600 IU of Vitamin D per day is essential for ensuring good bone health. It’s important to note that high doses of Vitamin D – above 10,000 IU per day – could cause damage to your kidneys or have other harmful side effects. This is usually found to be a result of the over use of supplements; do not take more than 2,000 IU of Vitamin D per day unless under a doctor’s care. You can also get Vitamin D by sitting in the sun for 10-15 minutes – but be sure to wear sun screen! Now it’s time to celebrate National Milk Day and be good to your body with a nice cold glass of milk! Happy National Milk Day! MOOO!! This entry was posted on Sunday, January 8th, 2012 at 8:10 PM	and is filed under Misc.. Both comments and pings are currently closed.